Taylor was joined on the women's side by Purdue's Dani Bunch, a track and field stand-out from Purdue. Only the second Penn Stater to ever to be named Big Ten Male Athlete of the Year since the honor's inception in 1982, Taylor joins men's gymnast Luis Vargas, who won the award in 2005. He is the eighth wrestler to win the award. Six Penn State women have been named Big Ten Female Athlete of the Year, with the last being Megan Hodge (2010, women's volleyball). Taylor recently wrapped up one of collegiate wrestling's most historic careers. He won the 2014 Hodge Trophy as the nation's top wrestler and was Big Ten Wrestler of the Year for the third time. 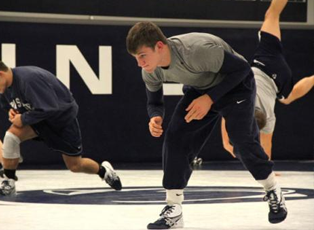 Taylor became Penn State's first-ever four-time NCAA finalist and won his second NCAA individual title in the 165 pound weight class, leading Penn State to its fourth-straight NCAA Championship in Oklahoma City in March. Taylor's 2014 accolades were certainly not few: Hodge Trophy Award (won twice during his career), NCAA National Champion (for the second time), NCAA Finalist (for the fourth time), NCAA All-American (for the fourth time), Big Ten Wrestler of the Year (for the third time), NCAA Most Dominant Wrestler Award, NCAA Championships Outstanding Wrestler, Big Ten Champion (Penn State's first four-time Big Ten Champion, joining Ruth with that honor), three-time Big Ten Wrestler of the Week, Academic All-Big Ten (for the fourth time), NWCA First Team All-Academic (for the fourth time), Capital One First Team Academic All-American. So it's safe to say Taylor's latest award might just mean he'll be needing a new trophy case sometime soon.